More than 100 firefighters have tackled a blaze above a store in central London's busiest shopping area. 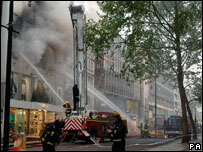 The fire broke out in a flat above the New Look store in Oxford Street, close to Oxford Circus, just before 1900 BST. The Fire Brigade said it had been forced to send more crews in an effort to bring the fire under control. There are no reports of injuries but nearby buildings have been evacuated and the area is closed between Oxford Circus and Tottenham Court Road. Bilal Khan, whose father owns a souvenir shop opposite the location of the fire, said he saw flames coming out of the building. "I was the first person to run out and I saw flames blazing out of the window and the window shattering on the floor across the road." The area was expected to remain closed until noon on Friday as inquiries continue into the cause of the blaze.